This card is a Valentine’s Day card made without any images of hearts! I’m just trying to mix it up a bit. However, the colors: reds and pinks are appropriate for V-Day as are the flowers and the sentiment! Also, this is a submission for the Ellen Hutson Mix It Up Challenge where you must use any Essentials by Ellen product(s), paired with any Hero Arts product(s). 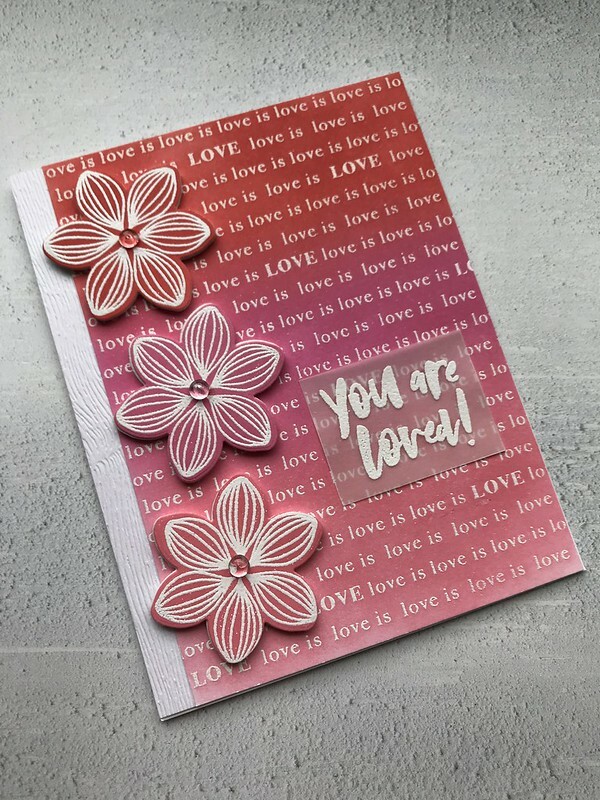 The flowers and the “You are loved!” sentiment are from two Essentials by Ellen stamp sets and the embossed-resist background is a Hero Arts cling background stamp. I used 3 colors of Distress Oxide inks to create an Ombre colored background. The sentiment was also heat embossed using white embossing powder on vellum. Hope you like the card and have a great day! Essentials by Ellen: Rustic Botanicals stamp set (flowers); Essentials by Ellen: Totally Random Sayings Vol. 1 (sentiment). Hero Arts: Love is Love Bold Prints background stamp. Distress Oxide Inks in Candied Apple, Picked Raspberry, and Worn Lipstick (for Ombre background and each flower). Tsukineko Versamark Ink (for heat embossing). Essentials by Ellen: coordinating dies for Rustic Botanicals (flower die). Neenah Solar White 110# (card front and card base). Essentials by Ellen Woodgrain Embossed cardstock (used as a mat for the card front).